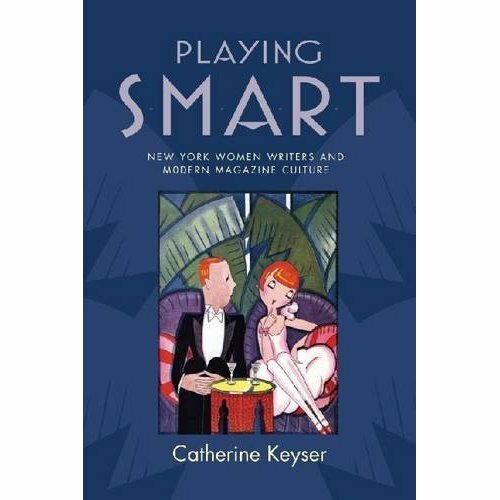 The final installment of the MagMods Book Club reading of Playing Smart comes from the author herself, Catherine Keyser, assistant professor of English at the University of South Carolina. It has been a tremendous pleasure hosting this book club reading and we are deeply grateful to all the participants but Catherine in particular, who exhibited such grace and fortitude from start to finish. I’d like to begin my remarks on a personal note rather than a scholarly one. It was a simultaneously humbling and inspiring experience to read such thoughtful and eloquent posts from the book club participants responding to Playing Smart. The generosity of these intellectual explorations, the contextualization and conceptualization of magazine culture and humor that each contributor shared, is an embarrassment of riches. I offer my deepest thanks, not only for your feedback on my work but also for the delightful experience of reading your blog posts—each one witty, expert, and provocative. The seven posts fell into three major categories that I will tackle here (though there is much more that I could say and write about in reply to such rich posts): the humor and style of these smart writers and how (or whether) they produce cultural critique; the challenge of defining a periodical context; and the role of irony in modern and contemporary media. As Daniel Worden observes, style is a key term of intersection between my counter-tradition (I extend thanks to Robert Hurd for this perfect term) of smart women writers and our traditional understanding of American modernism. Recent critics of modernism, the middlebrow, and celebrity, such as Aaron Jaffe and Faye Hammill, have offered nuanced ways of theorizing style as a connector between persona and magazine, author and media, modern(ist) writer and publicity culture. This attention to style as a synecdoche for persona partially explains my hesitation at taxonomizing humor as Eurie Dahn speculates I might in her very helpful post. While Playing Smart performs literary-historical work by constellating these women writers through their topical, stylistic, and biographical overlaps, it also draws upon models from feminist criticism and periodical studies that attend to the strategic and cumulative nature of persona construction and deployment (such Jean Lutes’ excellent Front Page Girls). Humor provides a frame for this creation of persona and also a disguise for its daring implications. To separate individual techniques could impose a style of analysis inadequately responsive to the deft and versatile movements these writers achieve between grotesque exaggeration, epigrammatic wit, and scathing sarcasm (to suggest just a few of the tones and techniques that appear in their work). Both Dahn and Hurd asked about modern readers and how they might have received this middlebrow humor. Hurd resisted the term “counterpublic,” suggesting that its use speculates about the unsubstantiated responses of contemporaneous readers. (In a sidenote: Fauset, McCarthy, and Powell all depict fictional counterpublics in their novelistic depictions of modern magazine culture. They want to reclaim political potency for smartness and sophistication, recognizing that its rhetorical power is aligned with commodity and consumer culture, and thus they represent magazine readers and writers with specific cultural and political ideals—from Harlem Renaissance, Trotskyite, and queer and bohemian perspectives.) An area of inquiry I find really exciting (though beyond the scope of my book) is the investigation of this very question about modern readers and their reception of these 1920s women writers. When Robert Scholes writes so thoughtfully in his post that the smart magazines mattered in this period, his words may apply to a wider circle than the fiction writers in my book and their literary milieux. The smart woman persona seems to have served as an authorizing fiction for professional women of the period across the United States. Contemporaneous newspaper articles describe young women penning their own light verse and quoting Dorothy Parker and Lois Long at parties; one specifically interviews a single woman who tested her potential mates for a sense of irony. Thus, Parker’s wit becomes a litmus test for companionate marriage. A colleague of mine shared her mother’s story; a Parker fan, she kept a book of her poems on her desk throughout her accomplished career as a newspaper editor in Alaska. This identification and inspiration suggests that this counter-tradition did play an important cultural role, validating women’s desires to achieve professionally and prove their worth beyond domestic terms. Dahn, David Earle, and Michael Rozendal all raised questions about periodical context—how I arrived at my set of examples, where I might have expanded my set, and what reading strategies I brought to the magazines. I came to periodical studies through my work as a feminist literary critic; beginning the project inspired by the ethos of sophistication shared by Millay, Parker, and Dawn Powell, I discovered that this tone and its opportunities arose from the rich middlebrow print culture of this period. It was exciting to explore magazines like The Crisis and the Partisan Review that did not obviously share this flippant tone; as I began, I found the Crisis clearly didactic, and then as I read further, I began to realize that the use of irony and a classed cultural ideal linked this publication with Vanity Fair and the New Yorker. As Dahn suggests, I do not offer a full account of the Crisis and its exchanges with the magazine industry of white New York. However, its fascinating combination of didacticism and irony, earnest striving and cultural critique gives a vital clue to understanding Fauset’s work, which is often (and understandably) read under the sign of domesticity, didacticism, and melodrama and less often understood as an investigation of the opportunities and costs of humor. Similarly, in addressing Mary McCarthy, about whom Rozendal writes so astutely, I concentrated on her collection of short stories rather than her journalism because they provided a clearer reaction to the smart magazine culture of a generation before. Most of the short stories in The Company She Keeps were originally published in magazines, including the glossy Harper’s Bazaar, but I was most interested in how McCarthy depicted the relationship between the smart woman figure and the magazine industry because she alluded so specifically to the witty feminine ideal of the 1920s. Her Partisan Review theatre reviews give a fascinating look into her assessment of theatrical modernism and merit further attention. Finally, Earle makes the crucial point that smartness moved beyond the boundaries of “canonical” magazines like Vanity Fair and the New Yorker. For this book, I was specifically interested in the kind of bourgeois aspiration displayed by and the professional audience hailed by Vanity Fair, the New Yorker, and even Harper’s Bazar in the mid-1920s when Gentlemen Prefer Blondes was serialized. The types of magazine personae inhabited by these women writers were formed by this class aspiration as well as by this middlebrow modulation of modernism (and Earle cites some wonderful sources that substantiate this smart-magazine-as-cultural-crucible reading). Correlating the personae that Millay developed for a single periodical like Vanity Fair allowed me to see her play with liberty, irony, and sexuality—all tokens of Vanity Fair’s advertising strategies and fascination with the modern woman. Deborah Woodard has done awesome work on Millay’s Nancy Boyd stories for Ainslee’s, which were tonally distinct from her Vanity Fair work—moving further towards exaggeration, grotesquerie, and full-blown bohemian parody. Further work needs to be done in fleshing out the cultural ideal of smartness in the modern magazine industry, I agree, especially because it has such gendered implications, as Hammill and Simone Weil Davis have both suggested in their work. 3) Irony – Are we beating them or joining them? Finally, a few earnest words on irony…I have to believe that irony can be a constructive voice and even a frame for re-envisioning the world around us. Though I certainly can’t dispute that irony often enables a collapse into complacency (and in each of my chapters, I suggest the distressing ways that it can echo snobbery, encourage passivity, and provide evidence of engagement without actual action), I take Powell’s point in Turn, Magic Wheel that juxtaposing euphemism with wisecrack, ideal with reality, and desire with disappointment is a vital form of critical citizenship. I was so glad that Verna Kale picked up on the Palin connection in her reading of my Powell chapter; I was working on chapter revisions when Palin appeared on the political scene (decidedly not with a smart persona), and the overlaps between Powell’s satire of Clare Boothe Luce and that unfolding saga were (and are) chilling. Powell made me laugh at these connections without sacrificing a feeling of political urgency. As the popularity of the Daily Show and the Colbert Report suggests, laughter is a crucial way to stave off political despair, and irony can be crucially educational—showing a mass media audience the absurdities of propaganda, the inconsistency of airy ideals, and the dangers that these fictions pose when they organize our political experience. Certainly, the smart women about whom I have had the privilege to write educated me about the opportunities of irony—their counter-tradition providing an inspiring example of having your cake (celebrity, a mass audience, a sense of humor) and eating it too (strategic persona, sophisticated readers, ironic critique). So too is the opportunity to read and respond to such rich posts an honor and privilege for this scholar—getting to play the double role of reader/fan and writer/respondent. Thanks again. This entry was posted in Commentary, Events and tagged book club, Catherine Keyser. Bookmark the permalink.